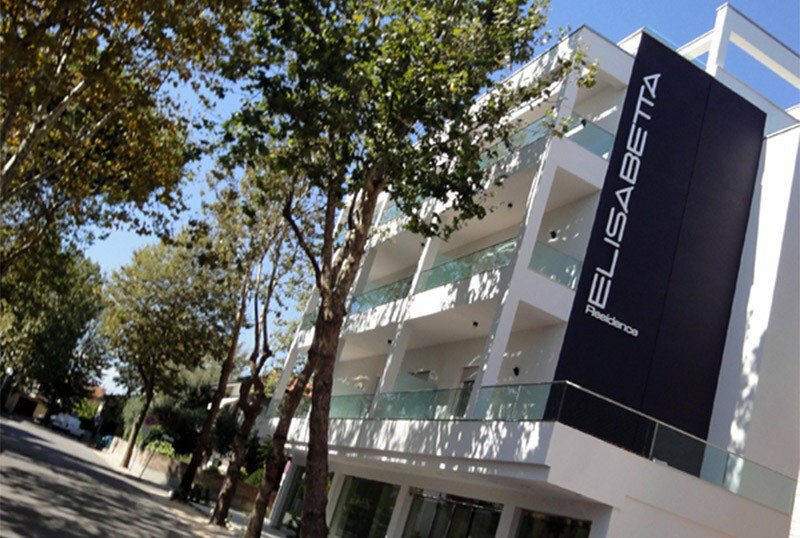 Residence Elisabetta is a 3-star superior hotel recently built in Cesenatico. It offers apartments of different sizes, able to accommodate from two to six people. Services for disabled people, parking and WI-FI available. Small pets are allowed. The property is located a few steps from the beach in Villamarina di Cesenatico. PORTO CANALE : 26.70 sqm studio that can accommodate two people or a couple with a child. It has a balcony of 7.9 square meters equipped with table and chairs, hallway, private bathroom with shower, living room with equipped kitchen and microwave, refrigerator, dishwasher, 32 "LCD TV and SKY package, WI-FI. there is a double bed with possibility to add a cot for children up to 5 years Air conditioning on request for a fee. BEACH : one bedroom apartment of 36 sqm with a balcony of 7.9 sqm equipped, living area divided by sleeping area, able to accommodate groups and families of four people. It has a living room with sofa bed (double or twin beds), kitchen equipped with microwave, fridge and dishwasher, 32 "LCD TV and SKY package, WI-FI, private bathroom with shower box, sleeping area with double bed and LCD TV 32 "(possibility to add a cot for children under 36 months). Air conditioning on request for a fee. BOAT : one bedroom apartment of 36 sqm with two balconies of 8 sqm each, living area divided from the sleeping area, able to accommodate up to 5 people. It has a living room with sofa bed (double or twin beds), kitchen equipped with microwave, fridge and dishwasher, 32 "LCD TV and SKY package, WI-FI, private bathroom with shower box, sleeping area with bedroom with double bed and further single bed, 32 "LCD TV. PESCHERECCIO : one bedroom apartment of 46 sqm with two balconies of 8 sqm, living area separated by sleeping area, able to accommodate up to 5 people. It offers a large living room with sofa bed and the possibility of adding a single bed, kitchen equipped with microwave, fridge and dishwasher, 32 "LCD TV and SKY package, WI-FI, private bathroom with shower box. of double bed and possibility to add a cot for children under 36 months, 26 "LCD TV. GRATTACIELO : one bedroom apartment of 46 sqm with two balconies of 8 sqm, living area divided by sleeping area, able to accommodate up to 6 people. It consists of a living room with sofa bed (double or twin beds) 26 "LCD TV, kitchen equipped with microwave, fridge and dishwasher, private bathroom with shower and hairdryer, sleeping area with bedroom with double bed and possibility to add a cot for children under 36 months or a single bed, 32 "LCD TV and SKY package, WI-FI. Sun terrace, hydromassage, bicycles, washing machine and dryer, lift, reading room, beach towel. Guests of the hotel can use the swimming pool and gym of the Hotel Elisabetta, located a few meters away. AIR CONDITIONING : available with supplement. SERVICES FOR DISABLED : entrance on the ground floor, inclined ramp, lift for disabled people, room with wheelchair maneuver and aids, bathroom with shower accessible. PETS : small pets allowed and within 10 kg. In the room : cots, cribs. On request baby package that includes side rails, high chair, baby bath. The guests of the residence can use the outdoor swimming pool and Jacuzzi located at the Hotel Elisabetta. Also available a relaxation area with loungers and parasols.